2011 is coming to an end. There are only three days left and the final match of the 9th Tong Yang Life Insurance Cup is the last Tygem celebration, like fireworks between Christmas and New Year. "hope(P)" won the first game against "idontca1". It was another extraordinary game and there are many interesting things to comment. As I said in all previous articles related to "hope(P)", he is a very impressive player, with such a natural and powerful style. The first question was who is hiding behind this account and the half answer was that he should be an absolutely top player. The second question was who can beat him, if he continues to play like this. There is no answer yet to this second question. He seems to be as hard as a rock. The good news is that, at least, we can fully answer now the first question: "hope(P)" is Tan Xiao, 5 P, another rising star in China. He is the student of Nie Weiping ( the legendary Iron Keeper of Chinese Go) and was born on 10.03 1993, so he is 18 years old (not 8 as I feared in a joke). Tan is only 2 months younger than Park Junghwan, who is born on 11.01.1993. 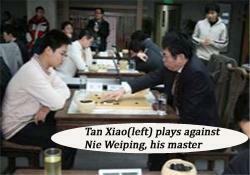 Tan Xiao is the national champion of China in 2011 and now I remember some Chinese comments saying that the national champion was playing in the tournament. The translation was very bad, so I did not know exactly to whom it was related and I was prone to take it as a figure of speech. At the end of August 2011, Tan was number 3 in the Chinese ranking. Then comes the next interesting part of the story. Yesterday, "idontca1" played 4 games against "tryortry". The result was 2 - 2 ( "tryortry" won the first 2 games and "idontca1" the last 2). Guess who "tryortry" is! Yes, your guess is right, "tryortry" is ...Tan Xiao. Did "idontca1" fall somehow into a trap, to reveal more of his secrets just hours before the Final? However, I believe it was more a deliberate action and he knew exactly what he was doing, just as he did against "wjx(P)", before the semifinal game. It was espionage from both sides. The first 20 moves of the first game of the Final were the same as in the fourth game between "idontca1" and "tryortry" ( a mirror of that game, with a small difference : white played D16 there and not D17). "idontca1" chose a weird strategy. Until move 52, all black stones (except 1 at Q16 and 19 at Q10) were on the third line or lower! Probably he thought that playing so tight was the answer to the second question. The funny thing is that, when he placed his first stone on the fifth line, 53 at E7, white invaded immediately with 54 at C7 ! Apparently, "idontca1" had much more territory, so "hope(P)" started to chase the black groups. Life has become increasingly difficult for the Korean player. He had to make miracles to save all his stones. First he saved the group on the left, with a nice inventive move, 109 at C12 ! Then came the turn for the center group to be saved. It seemed completely dead, but "idontca1" kept it alive miraculously, with exceptional moves, like 157 at N6 and 161 at M2 ! The Korean viewers breathed more freely and proclaimed victory. However, they were wrong. "idontca1" played brilliantly to save the groups in danger, but somehow during the process, the territorial balance has changed, since he had to make only inefficient defensive moves. In other words, a sad conclusion from "idontca1" point of view : he played brilliantly just to save the stones, but not the game. Only one chance is left for "idontca1" now : to win tomorrow and bring the match into New Year's Eve for the third decisive game. One last note. The final match has sparked so much interest, that even the competition room (usually so little crowded) was no more accesible for the English Tygem viewers who tried to enter only few minutes later after the game started. So, if you want to watch the game live tomorrow, take an early seat in any room (due to that stupid rule of 300 viewers limit). Once you are in the game, they don't throw you out.